You can’t make a “real” phone call unless you have Skype Credit on your account. You add Skype Credit by touching the Profile button and choosing Skype Credit. You see a big dial pad for typing phone numbers, just like you would if the Galaxy Tab were a huge cell phone. Or, use the Contacts button in the upper-right corner of the screen to summon a contact. Choosing a contact places his number on the Call tab. Always input the full phone number when making a Skype phone call, including the country code, shown as +1 for the United States, as well as the area code. Touch the Done button to dismiss the onscreen dial pad. This step works just like using a cell phone. Indeed, at this point, the Galaxy Tab has been transformed by the Skype app into a cell phone (albeit a cell phone that uses Internet telephony to make the call). 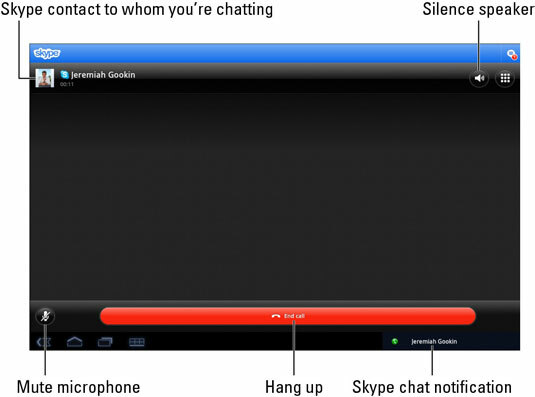 The In-Call screen looks nearly identical to the incoming call screen for Skype audio chat. The biggest difference is the per-minute price listed beneath the contact’s name in the upper-left corner of the screen. To end the call, touch the End Call button. If the number you dialed isn’t a current Skype contact, touch the Add Contact button to create a Skype contact for that person. 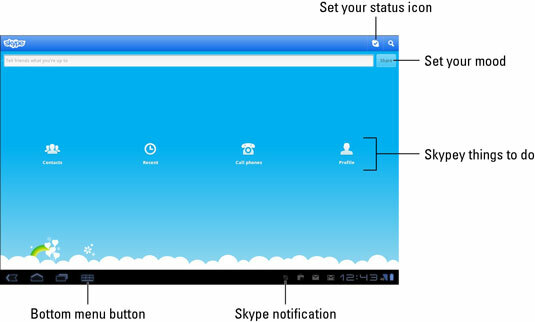 Skype contacts are separate from Galaxy Tab contacts. By touching the Add Contact button, you create a phone number contact for the number you just dialed. Lamentably, you can’t receive a phone call using Skype on your Galaxy Tab from a cell phone or landline unless you pay for a Skype online number. In that case, you can use Skype to both send and receive regular phone calls. You can check Skype for a current list of call rates, for both domestic and international calls. Unless you’ve paid Skype to have a specific phone number, the phone number shown on the recipient’s Caller ID screen is something unexpected, often merely the text Unknown. Because of that, you might want to e-mail or text the person you’re calling and let her know that you’re placing a Skype call. That way, she won’t skip the call because she doesn’t recognize the Caller ID number.